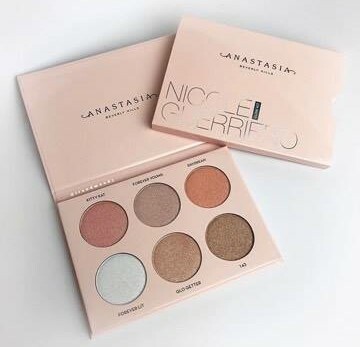 Highlighting and collabs appear to be two trends that are here to stay and the latest one to circle the social media pages and create an almighty buzz is the Nicole Guerriero Glow Kit ($40) from Anastasia Beverly Hills. The ABH Glow Kits continue to cause quite a stir because they are hugely popular and seemed to have inspired a wave of highlighting and strobing palettes from other high end companies. 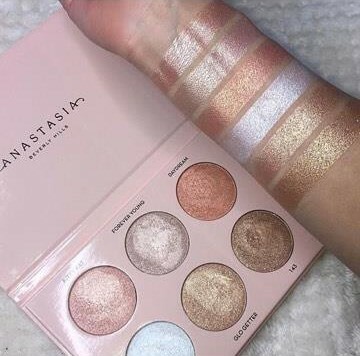 Although, you can definitely glow on a budget (Sleek and Wet n Wild have some incredible highlights) Anastasia have created glow kits suitable for pretty much every skin tone. Nicole's pink Glow Kit looks so girly and pretty that I wish it had been around for Valentine's Day. It would have made such a gorgeous gift. The colours look beautiful, mostly pink and gold with a bright almost blue-tinged highlight (Forever Lit). Overall, I think the palette has a Barbie feel and even though I am not a girlie girl at all I find it very attractive. It will be released and available to purchase on the Anastasia Beverly Hills Website on the 3rd March 2017 and in Sephora the 15th March. Based on the Moonchild Glow Kit which also has 8 shades like this one I think the price should be around $40. I don't have any information on when it will be available in the UK or even if it will be available as soon as those details come to light I will add them to this post. The Glow Kit has a total of 6 shades: Kitty Kat (berry pink with platinum shimmer); Forever Young (pink pearl with silver shimmer); Daydream (goldfish orange coral with white gold shimmer); Forever Lit (icy platinum with lavender shimmer); Glo Getter (champagne with rose gold shimmer) and 143 (rose gold with bronze shimmer). 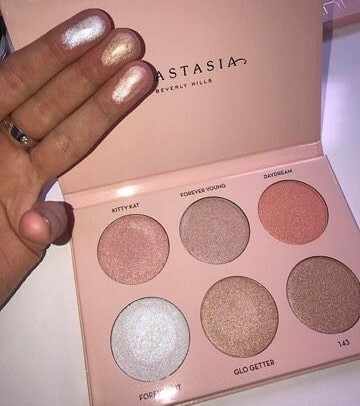 I am not sure what they will look like on the cheeks, as always I do think ABH slightly exaggerate the pigmentation on their website as otherwise these "glow getters" would be foiled eyeshadows. I do think they look super intense but find the overall colour selection quite heartwarming. It is so girly and cute and pretty it makes me want to dance around the beach blowing bubblegum like I am in a 50s Coke advert. Coco Cola, not cocaine, to be clear. Thank you for reading, I would love to know what you think about this collaboration. I don't know anything about Nicole Guerriero, I don't watch her videos but the palette looks really nice. I am excited to see the photography that accompanies the launch as the Moonchild editorials were breathtaking. What do you think of the shades? Have you tried any other Glow Kits? Which ones are your favourite? Do you think you will buy this one? 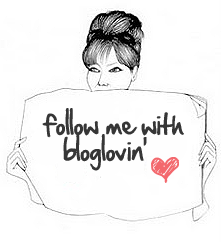 As always, please follow me on Bloglovin' if you aren't already it means a lot to me and leave your answers and thoughts in the comments below. 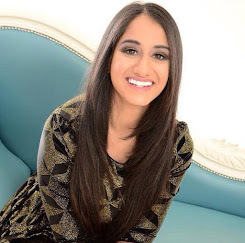 I love reading your comments and hearing from you. I hope you are having a great week. Take care. 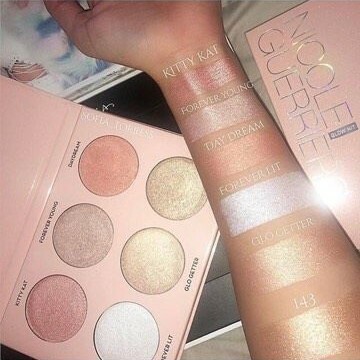 What do you think of the Nicole Glow Kit? *Photos taken from TrendMood1, Nicole Guerriero's and Anastasia Beverly Hills Instagram Feed. This palette looks so good! I have to get this. I don't watch or follow Nicole Guerriero either, but I like the look of this palette and, as you said, the barbie (yet not too girly either) feel to it! Oh wow, this looks amazing! Can't wait to try it! Such an amazing palette! I think my favourite shade is day dream or glo getter! I used to watch Nicole and I used to enjoy her vlogs, they were so much fun. This is a lovely collaboration and this palette is gorgeous, I mean, look at these shades, they are stunning! Honestly, the highlighting game still continues but BECCA is my go-to for any colours! Also, this kit is great for makeup artists and doing your makeup at home but for travelling, seems too large and cumbersome! Great review, have a great day! This has been getting really good reviews but am I the only one who is tired of YouTuber collabs? I just feel overwhelmed by the non stop collabs these days. I'm still yet to try a ABH highlighter but this palette is probably my favourite looking one so far, very very tempted! Agreed it looks very Valentines appropriate! always wanted to try this palette! I wish you could buy just an individual shade, Forever Young looks right up my street! These look sooo incredibly amazing!!!!! :D I really want to check it out now haha so pigmented and those shades would work so well for so many different skin types!! I think it's really pretty, but I'll probably skip out on it! Very interesting collab. I didn't even realized there was a collab until today. I don't plan on picking it up but it is a pretty palette. this glow kit is insane. i saw jeffree star testing it and i was blown away. even though i don't do tons of highlight on a day to day basis, i love this. The shades are speaking to me...Will work well with my skin tone. Glowing! How I wish I can afford this highlighters!